“A bottle of red, a bottle of white, it all depends upon your appetite,” sang Bob Dylan in Scenes from an Italian Restaurant. He could not have been more right. Turns out, your taste in wine has a lot to say about your personality. Some women will only drink red, and others will only drink white – and this often causes some debate about which is better. Nothing is more romantic than a bottle of red wine, like a luscious Merlot, over candlelight. Red wine is the kind of drink you get cozy on the couch with and switch on a lovey-dovey movie on Netflix or read romance novels while sipping. I mean, red is the color of passion, after all. White wine cannot compare, but that is because white wine drinkers tend to be a bit more energetic. White wine drinkers live more for spontaneity rather than romance. These kinds of people prefer sipping their pinot grigio or chardonnay on a beach and holding their glass up to the sunset. Red and white wine lovers really go at it when it comes to flavor. Wine, depending on the grape, region, brewing process, and added ingredients can have a vast flavor profile. In general, white wine drinkers will claim that it is the citrusy, buttery, and maple or oak notes of white wine that makes their drink of choice so awesome. Besides, when the last time you heard of red wine being dry and crisp? But, red wine drinkers can always come back with the fact that red wine has less sugar than white, is subtler, silkier, and is the category Malbec calls home. Malbec, in case you are unfamiliar with it, is a certain type of red wine that tastes like chocolate cake. Red wine complements red meats, hearty stews, pepperoni pizza, roasted vegetables and herbaceous seasoning. White wine better suits lightly grilled seafood, garlicky sauces, and citrus-based marinades. Naturally, those who prefer one diet type over another will ultimately go for the wine that tastes best with their food choices. One wine drinker will definitely call themselves more thrifty than the other. That would be white wine drinkers. Financially speaking, white wine costs less than red wine, and that is because of the growing and harvesting process of the grapes. Another factor that goes into the price is the amount of alcohol in the beverage. Sorry, white wine drinkers, red wine has anywhere from 12-15% alcohol per glass on average. White wine falls into the 10-14% range. Red and white wine drinkers may find themselves arguing over the health benefits of wine, the duration of hangovers, and other factors. First, red wine drinkers have the right to boast about choosing the healthier drink, since red wine has more phytonutrients, tannins, and less sugar. On the other hand, pinot grigio is the lowest calorie wine, regardless of its color. In terms of a hangover, both groups lose. It depends on how much you drink. Still, nothing beats a glass of cool wine after a long day, regardless of its color. Though, if you need to let loose, you can do so with white, because if you spill it on yourself or the floor, you do not have to worry about stains. Opting to throw wine in someone’s face, though? Yeah, you will want to choose red for that one. Preferably a port. Whatever wine you choose, I am sure we can all agree that having a glass of wine, regardless of its color, is better than having no wine at all. 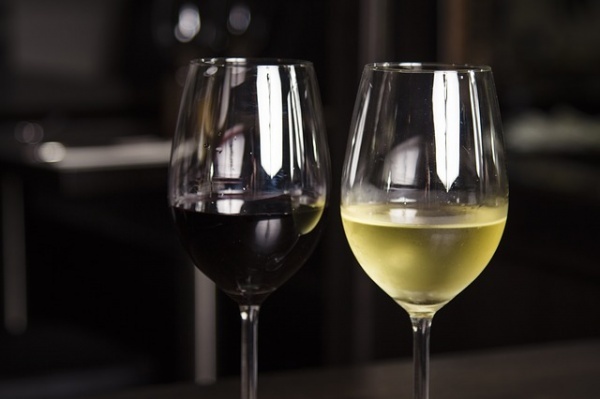 Red and white wine both have health benefits and a wide range of flavors, so drink up, and never let anyone tell you that your favorite bottle is not good enough. If it hits the spot for you, then drink up.